We’d love your help. 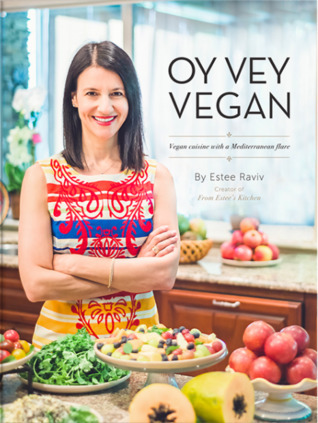 Let us know what’s wrong with this preview of Oy Vey Vegan - Vegan Cuisine with a Mediterranean Flair by Estee Raviv. Released in November 2016, Oy Vey Vegan is a journey into the wide world of plant based foods. Recipes were initially created out of my own curiosity for new flavors combined with old ones, and further perfected with a Mediterranean flare, into the vegan world. Most of the recipes you will find in the book are gluten free (GF) or can be easily transformed into GF. The book Released in November 2016, Oy Vey Vegan is a journey into the wide world of plant based foods. Recipes were initially created out of my own curiosity for new flavors combined with old ones, and further perfected with a Mediterranean flare, into the vegan world. Most of the recipes you will find in the book are gluten free (GF) or can be easily transformed into GF. The book was created to help address the need for people who want to make a positive change in their life and healthy diet and do not know how. With mainly simple recipes Oy Vey Vegan will be a useful guide to begin your own journey. Preventative medicine is the future, start now with a healthy life style and you will feel the difference almost immediately. Every recipe includes a photo, and written in a clear and easy to follow manner. This book is a labor of love. You will enjoy it as much as I enjoyed creating it. 153 Vegan recipes and mostly gluten-free (GF) or GF-optional recipes divided into breakfast & brunch, appetizers, spreads & side dishes, soups & salads, burgers & patties, main dishes, pasta and desserts. Oy Vey Vegan is a labor of love, combining passion, creativity and curiosity for the fascinating vegan world of plant-based foods. You can create amazing vegan dishes. Complex in flavors, sophisticated yet simple to make. I wanted to share my own journey, and I feel that after much research, this is the way to go. Not only you will do good to the environment, you will do better for your own body by increasing level of energy, reduce risk for cancer, diabetes, and heart disease. Studies show that people who eat vegan are healthier, leaner, and live longer. And to be honest, it is so much tastier. To ask other readers questions about Oy Vey Vegan - Vegan Cuisine with a Mediterranean Flair, please sign up. Amazing book with easy to follow healthy recipes! My love of cooking and healthy food has been inspired by a life filled with art, travel and a world of cultures and experiences, all shared with family and friends. My name is Estee. Born in Israel, I grew up on the sandy shores of the Mediterranean Sea. Meals when I was young were influenced by flavors of the Middle East, along with my Jewish heritage and the Eastern European traditions of my Roma My love of cooking and healthy food has been inspired by a life filled with art, travel and a world of cultures and experiences, all shared with family and friends. My name is Estee. Born in Israel, I grew up on the sandy shores of the Mediterranean Sea. Meals when I was young were influenced by flavors of the Middle East, along with my Jewish heritage and the Eastern European traditions of my Romanian mother – an incredible cook and hostess – and Polish father. My culinary experiences were further enriched by my family’s travels around the world, exposing me to wonderfully diverse foods and traditions.